system 5 - Industrial UT Inspection System Position SensorProblem:UT inspection is an extremely common non-destructive testing process that is widely used in many industries: Petrochemical, Oil&Gas, Utilities, Energy, Municipal Infrastructure, Food&Beverage, etc...Industrial applications range from measurement of wall thickness in oil & gas pipe lines (to evaluate corrosion damage) to the measurement of defects in composite parts of wind turbines to microstructure evaluations of welds during pipe manufacturing.The current ultrasound pipe inspection method involves manually marking a grid over the surface of the inspected pipe and then identifying within the grid the position of all areas of interest..This information is collected manually and then transferred to the UT Inspection System. 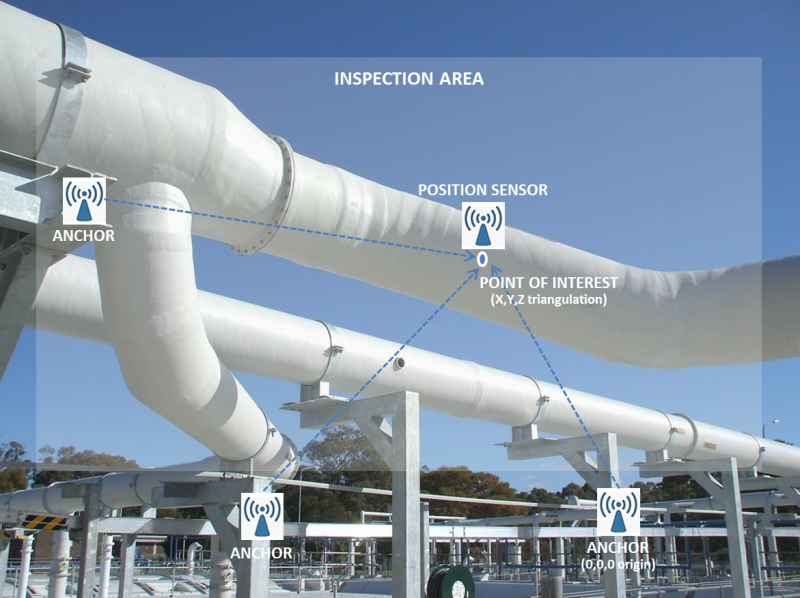 This process is time consuming and inaccurate.Since the inspector often has to climb on ladders or temporary scaffolding to reach the inspection area, this can also present a safety-hazard to the worker.The Value Proposition:A wireless, small footprint, battery-powered, easy to use and cost effective Position Sensor for the manual inspection of pipes, which fully integrates with a UT Ultrasound Inspection Instrument.Battery-powered radio Beacons are used to create a Cartesian coordinates space around the inspection area, where any position can be easily triangulated.Some of these Beacons are in fixed-known positions (Anchors) that are GPS tagged (only the Origin Anchor requires GPS coordinates information, the other Anchors auto-position themselves in reference to the Origin).A mobile beacon (attached to the Position Sensor) captures any point-of-interest coordinates (X,Y,Z) with reference to the Anchors coordinates system in real-time.Optical Rotary Encoders (connected to the Position Sensor wheels) are used for increased position accuracy and to measure surface areas on the curved surface of the pipe. A gyroscope is used for angular measurements and motion detection.The position coordinates and the angular data are sent to the UT Inspection Unit over Bluetooth, or other wireless Near-Field-Communication system, as required.Technical Specifications:1. 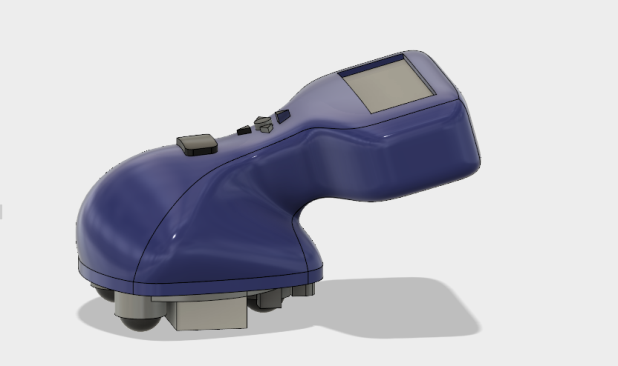 A wireless, battery powered Position Sensor that transmits 4-count absolute position information (X, Y, Z and Vertical Angle) to the UT inspection unit.2. 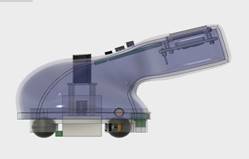 The Position Sensor is designed such as to meet the following specifications:1.Pipes with a diameter between 1” and 36” (12” nominal);2.Pipe elbows of 1.5D to 2.0D (D= pipe diameter);3.A minimal surface scan area (pipe surface) of 1m x 1m;4.5mm x 5mm linear positioning resolution;5.5mm x 1deg angular positioning resolution;6.Data transfer rate between the PS and the UT inspection is >100Hz (UT refresh rate is 20KHz);7.The physical space clearance for the PS unit is between 150mm and 600mm (300mm nominal);8.The PS is able to operate on pipes at heights of 1-30m above ground (10m nominal);9.The PS will be used in harsh industrial environments. The PS is designed to be resilient and hardened against impact;10.The technician using the PS will most likely be in confined spaces with limited mobility. The PS is designed for ease of use.11.The UT transducer typical probe size is 50mm x 20mm. The PS unit is design to accommodate a variety of UT transducer probes; The frame of reference for the positioning system coordinates can be easily reproduced and repeatable. A leave-in-place marker for the Origin Anchor point can be used. GPS tagging is used to geographically locate the inspection area within the work facility.3. A Near Field Communication (NFC) system (transmitter on the PS and receiver on inspection unit) transfers coordinate information between the PS and the UT ultrasound inspection unit.The PS unit has a user interface (LCD screen and selector buttons) easily accessible to the technician performing the scan.The PS Controller is able to store the data collected for at least the ongoing scan. Collected data is accessible from the PS user interface.6. The PS unit is designed to be easy to handle by the technician and will accommodate various pipe diameters and pipe elbows while maintaining the Ultrasound Transducer in close proximity to the surface of the pipe. Magnetic wheels secure the PS unit to the surface of the pipe.7. The developed a hardware/software solution is stable, reliable, and easy to update, enhance and maintain.Application Specifications:The system allows the technician to switch direction of movement during normal inspection and repeat scans of the same area.Calibration procedure to capture accurately the Zero-Origin for the scan. It is repeatable in case the PS loses its reference (for example, if the unit is by mistake removed from the pipe surface in the middle of a scan).3. In combination with the calibration procedure, the system allows return to certain coordinates captured during a previous scan.Multiple position coordinates can be captured around an area of interest – this has to be done in junction with the UT inspection instrument (combined functionality).The system allows the technician to repeat inspection of an area of interest during normal scan.6. The system User Interface (UI) assists the technician to follow the steps of standard procedures by displaying instructions and dialogs on the LCD display. 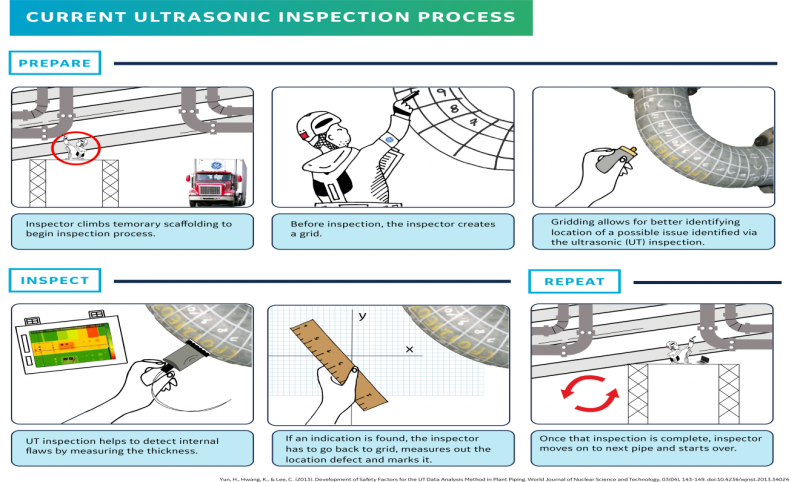 The technician will interact with the system by means of the selector buttons.Engineered Solution:The current ultrasound pipe inspection method involves manually marking a grid over the surface of the inspected pipe and then identifying within the grid the position of all areas of interest.This information is collected manually and then transferred to the UT inspection system. This process is time consuming and inaccurate.The proposed solution eliminates the need to manually create the reference grid and to enter the position coordinates into the UT inspection system.Mechanical Solution: Mechanics of the design:o Structure:The size of the device is 75mm x 125mm x 90mm.The unit is composed of sensors, wheels, and the UT probe. The wheels’ center of rotations is fixed relative to each other and the rest of the unit with the exception of UT probe.The rectangular bottom is designed to translate the force applied by hand directly to the sensor unit located on the bottom. The four pins also help align and guide the probe. The spring system presses against the unit and apply a downward force to the UT sensor. The spring force will be less than the magnetic force between the wheels and the pipe.o Wheels:Magnetic ball wheels are used to minimize slippage and discontinuity between the wheels and the pipes surface. The ball wheels allow for more versatile movement and ability to capture position if the user is interested in exploring around particular position. o Sensors:§ The gyroscope (illustrated in a blue color) is located above and at the center of the probe.§ The positioning radio beacon (illustrated in a green color) is located at the front (looking at right side of the front view).§ Optical rotary encoders are located at the front wheel (illustrated in a gold color) and they are able to detect movement in two axis.§ Capacitive touch sensor (illustrated in a green square) ––to identify that the probe is touching the surface. The sensor will be attached to the UT probe. Hardware/Software System Solution:o General Concept:Various transducers and sensors are used to determine the absolute position of the PS. An embedded controller acquires data from the sensors & transducers and manipulates it to determine the absolute position (4-point reference, X/Y/Z position relative to the origin and Pitch/Yaw) of the PS unit.The hand-held controller also assists the technician with the operation procedures by means of a local User Interface (LCD screen and selector buttons).The controller also handles the transmittal of the measurements data to the UT Inspection Unit over Bluetooth or other Near-Field-Communication method.o Controller:A local programmable embedded controller is used to acquire data from the sensors & transducers and to manipulate it in order to determine the position of the PS unit.The data acquisition is done by means of I2C busses, discrete and analog inputs. The data acquisition rate is between 10 and 20kHz. The controller will store the position data locally at least for the current inspection scan (see Operation Procedures section for detail). The controller will also store the Origin Anchor GPS information for the current inspection scan.The controller communicates with the local User Interface/LCD screen (I2C bus) and selector buttons (discrete inputs). This is to assists the technician with the operation procedures (see Operation Procedures section for detail).The controller also handles the transmittal of position data to the UT Inspection Instrument by means Bluetooth or Near-Field-Communication (NFC) radios.o PS User Interface:A local User Interface consisting of an RGB LCD display, a buzzer and 5 selector buttons is mounted on the handle of the UT PS unit. The LCD screen will display operational information for technician, status information and abnormal operating situations. It will also allow the operator to select certain actions or enter information by means of the 5 buttons. The color of the LCD display will change dynamically to indicate a certain state of the system or if an action is required. 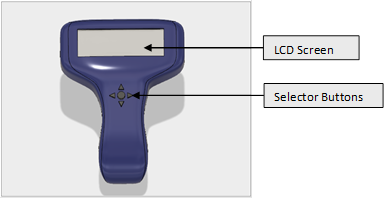 The color of the LCD display will change dynamically to indicate a certain state of the system or if an action is required: RED – abnormal operating conditions BLUE – normal operation WHITE – menu items or entry fields YELOW – technician attention or action requiredThere are 5 selector buttons for the technician to interact with the system:1. Arrow-Up - to move up through selections and to increment numerical values.2. Arrow-Down - to move down through selections and to decrement numerical values.3. Arrow-Right - to select to the right from multiple choices and to move to the digit to the right.4. Arrow-Left - to select to the left from multiple choices and to move to the digit to the left.5. Select/Enter - to select a menu item or to acknowledge an action requested by the system through the LCD display. o Mobile Application for Setup/Configuration:A mobile application (installed on the inspection technician phone or tablet) will be used to perform the initial system setup and configuration. 1. Join all the Anchor Beacons and the PS Beacon on the same dedicated wireless network. 2. Capture GPS coordinate for Origin Anchor. 3. Once all the Anchors are installed, activate Autoposition function (the other Anchors auto-position themselves in reference to the Origin Anchor). 4. Configure Data Services - communication settings and data transfer method (XML file or MQTT). Industrial applications range from measurement of wall thickness in oil & gas pipe lines (to evaluate corrosion damage) to the measurement of defects in composite parts of wind turbines to microstructure evaluations of welds during pipe manufacturing. The current ultrasound pipe inspection method involves manually marking a grid over the surface of the inspected pipe and then identifying within the grid the position of all areas of interest. This information is collected manually and then transferred to the UT Inspection System. This process is time consuming and inaccurate. Since the inspector often has to climb on ladders or temporary scaffolding to reach the inspection area, this can also present a safety-hazard to the worker. A wireless, small footprint, battery-powered, easy to use and cost effective Position Sensor for the manual inspection of pipes, which fully integrates with a UT Ultrasound Inspection Instrument. Battery-powered radio Beacons are used to create a Cartesian coordinates space around the inspection area, where any position can be easily triangulated. 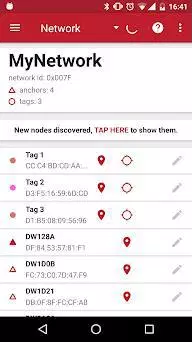 Some of these Beacons are in fixed-known positions (Anchors) that are GPS tagged (only the Origin Anchor requires GPS coordinates information, the other Anchors auto-position themselves in reference to the Origin). A mobile beacon (attached to the Position Sensor) captures any point-of-interest coordinates (X,Y,Z) with reference to the Anchors coordinates system in real-time. Optical Rotary Encoders (connected to the Position Sensor wheels) are used for increased position accuracy and to measure surface areas on the curved surface of the pipe. A gyroscope is used for angular measurements and motion detection. The position coordinates and the angular data are sent to the UT Inspection Unit over Bluetooth, or other wireless Near-Field-Communication system, as required. 1. A wireless, battery powered Position Sensor that transmits 4-count absolute position information (X, Y, Z and Vertical Angle) to the UT inspection unit. The technician using the PS will most likely be in confined spaces with limited mobility. The PS is designed for ease of use. The frame of reference for the positioning system coordinates can be easily reproduced and repeatable. A leave-in-place marker for the Origin Anchor point can be used. GPS tagging is used to geographically locate the inspection area within the work facility. 3. A Near Field Communication (NFC) system (transmitter on the PS and receiver on inspection unit) transfers coordinate information between the PS and the UT ultrasound inspection unit. The PS unit has a user interface (LCD screen and selector buttons) easily accessible to the technician performing the scan. The PS Controller is able to store the data collected for at least the ongoing scan. Collected data is accessible from the PS user interface. 6. The PS unit is designed to be easy to handle by the technician and will accommodate various pipe diameters and pipe elbows while maintaining the Ultrasound Transducer in close proximity to the surface of the pipe. Magnetic wheels secure the PS unit to the surface of the pipe. 7. 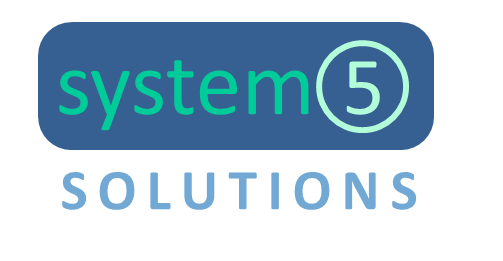 The developed a hardware/software solution is stable, reliable, and easy to update, enhance and maintain. The system allows the technician to switch direction of movement during normal inspection and repeat scans of the same area. Calibration procedure to capture accurately the Zero-Origin for the scan. It is repeatable in case the PS loses its reference (for example, if the unit is by mistake removed from the pipe surface in the middle of a scan). 3. In combination with the calibration procedure, the system allows return to certain coordinates captured during a previous scan. Multiple position coordinates can be captured around an area of interest – this has to be done in junction with the UT inspection instrument (combined functionality). The system allows the technician to repeat inspection of an area of interest during normal scan. 6. The system User Interface (UI) assists the technician to follow the steps of standard procedures by displaying instructions and dialogs on the LCD display. The technician will interact with the system by means of the selector buttons. The proposed solution eliminates the need to manually create the reference grid and to enter the position coordinates into the UT inspection system. The size of the device is 75mm x 125mm x 90mm. The unit is composed of sensors, wheels, and the UT probe. The wheels’ center of rotations is fixed relative to each other and the rest of the unit with the exception of UT probe. The rectangular bottom is designed to translate the force applied by hand directly to the sensor unit located on the bottom. The four pins also help align and guide the probe. The spring system presses against the unit and apply a downward force to the UT sensor. The spring force will be less than the magnetic force between the wheels and the pipe. Magnetic ball wheels are used to minimize slippage and discontinuity between the wheels and the pipes surface. The ball wheels allow for more versatile movement and ability to capture position if the user is interested in exploring around particular position. § The gyroscope (illustrated in a blue color) is located above and at the center of the probe. § The positioning radio beacon (illustrated in a green color) is located at the front (looking at right side of the front view). § Optical rotary encoders are located at the front wheel (illustrated in a gold color) and they are able to detect movement in two axis. § Capacitive touch sensor (illustrated in a green square) ––to identify that the probe is touching the surface. The sensor will be attached to the UT probe. Various transducers and sensors are used to determine the absolute position of the PS. An embedded controller acquires data from the sensors & transducers and manipulates it to determine the absolute position (4-point reference, X/Y/Z position relative to the origin and Pitch/Yaw) of the PS unit. The hand-held controller also assists the technician with the operation procedures by means of a local User Interface (LCD screen and selector buttons). The controller also handles the transmittal of the measurements data to the UT Inspection Unit over Bluetooth or other Near-Field-Communication method. A local programmable embedded controller is used to acquire data from the sensors & transducers and to manipulate it in order to determine the position of the PS unit. The data acquisition is done by means of I2C busses, discrete and analog inputs. The data acquisition rate is between 10 and 20kHz. The controller will store the position data locally at least for the current inspection scan (see Operation Procedures section for detail). The controller will also store the Origin Anchor GPS information for the current inspection scan. The controller communicates with the local User Interface/LCD screen (I2C bus) and selector buttons (discrete inputs). This is to assists the technician with the operation procedures (see Operation Procedures section for detail). The controller also handles the transmittal of position data to the UT Inspection Instrument by means Bluetooth or Near-Field-Communication (NFC) radios. A local User Interface consisting of an RGB LCD display, a buzzer and 5 selector buttons is mounted on the handle of the UT PS unit. The LCD screen will display operational information for technician, status information and abnormal operating situations. It will also allow the operator to select certain actions or enter information by means of the 5 buttons. The color of the LCD display will change dynamically to indicate a certain state of the system or if an action is required. 1. Arrow-Up - to move up through selections and to increment numerical values. 2. Arrow-Down - to move down through selections and to decrement numerical values. 3. Arrow-Right - to select to the right from multiple choices and to move to the digit to the right. 4. Arrow-Left - to select to the left from multiple choices and to move to the digit to the left. 5. Select/Enter - to select a menu item or to acknowledge an action requested by the system through the LCD display. A mobile application (installed on the inspection technician phone or tablet) will be used to perform the initial system setup and configuration. 1. Join all the Anchor Beacons and the PS Beacon on the same dedicated wireless network. 2. Capture GPS coordinate for Origin Anchor. 3. Once all the Anchors are installed, activate Autoposition function (the other Anchors auto-position themselves in reference to the Origin Anchor). 4. Configure Data Services - communication settings and data transfer method (XML file or MQTT). Copyright 2009 system 5 LLC. All rights reserved.